Nestled among the mountains somewhere in Vietnam, Guil Zekri interrupted his enjoyment of the breathtaking view to talk with us about his two favorite things—art and traveling. Born and raised in Israel, Guil departed The Holy Land at the age of 21 to trek around the world, beginning with Africa. His travels eventually led him to Paris, which he called home long enough to earn a master's in art aesthetics, apprentice at a studio where he cleaned floors more than anything else, and become discouraged, abandoning the world of tattoos. 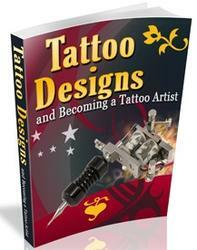 Now, as Guil slides into his sixth year as a professional tattoo artist, he examines the paths he took to get here. 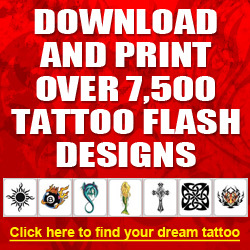 "I didn't really dream about becoming a tattoo artist," he explains. "I imagined myself more in the fine arts or as an art professor. But now that I look back on my life, somehow I have the feeling it was meant to be." Though he began getting tattooed at 17 to get back at his girlfriend for coming home with some ink, it took Guil many years to come to the conclusion that the best medium to work with in the art arena is skin. 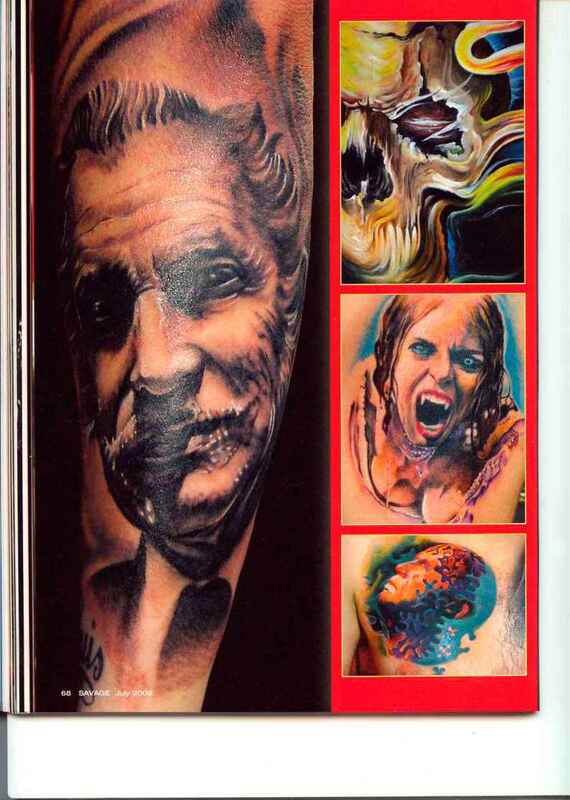 On a supposed three-month trip to Germany in 2003, Guil's interest in tattooing was reinvigorated when an artist invited him to exchange the secrets of tattoo technique versus painting—and Cologne, Germany, is where Guil has planted his feet ever since. 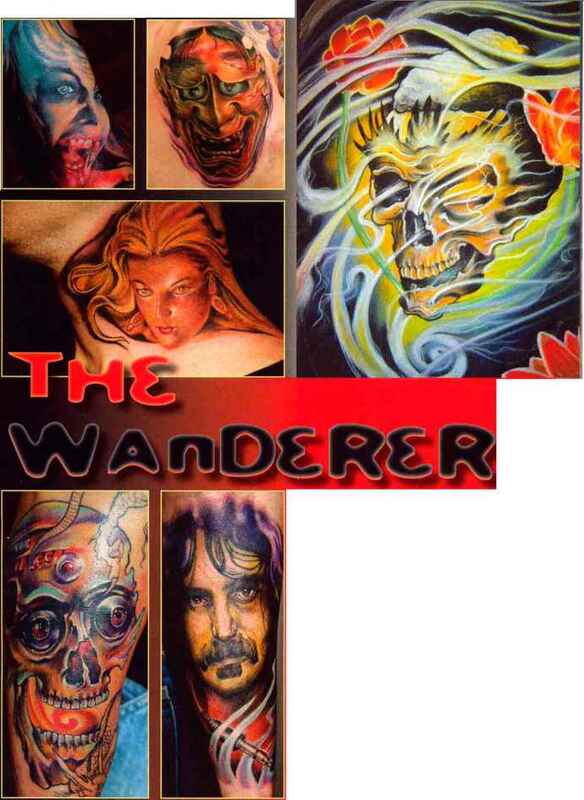 Drawing and painting have been a staple in Gull's lite for as far back as he can remember, so it's only natural for his painting style to appear in his tattoo work. "In fact," he reveals, "when I do my initial line work, I'm trying not to think about tattooing, i just think about painting or drawing and then slowly arrange the composition to look good on skin." Inspiration for his skin art is drawn from books he's read, museums he's visited, and places he's traveled, which ends up reflecting Guil in each piece he paints on his living canvases. It is perhaps this deep, personal connection he feels with each piece that emblazoned one of his clients in his memory for life. "I was tattooing an 18-year-old man's portrait (who passed away three weeks earlier) on his father. The portrait was done in black and gray, mixed with ttie young man's ashes. It was the first time I did something like that—and, without a doubt, definitely the last." Dave Hood's mom used to be a nun. No, sen-1 ously. And when we tell you she's the more open-minded of Dave's parents, you kinda get| an idea of just how conservative they are. Thus, their son wears whatever it takes— long-sleeve shirts, mittens, scarves—to hide ' his tattoo work from them. The dedication Dave shows for his tattoos goes far beyond clothing. For his 23rd birthday, he got tattooed four days in a row. 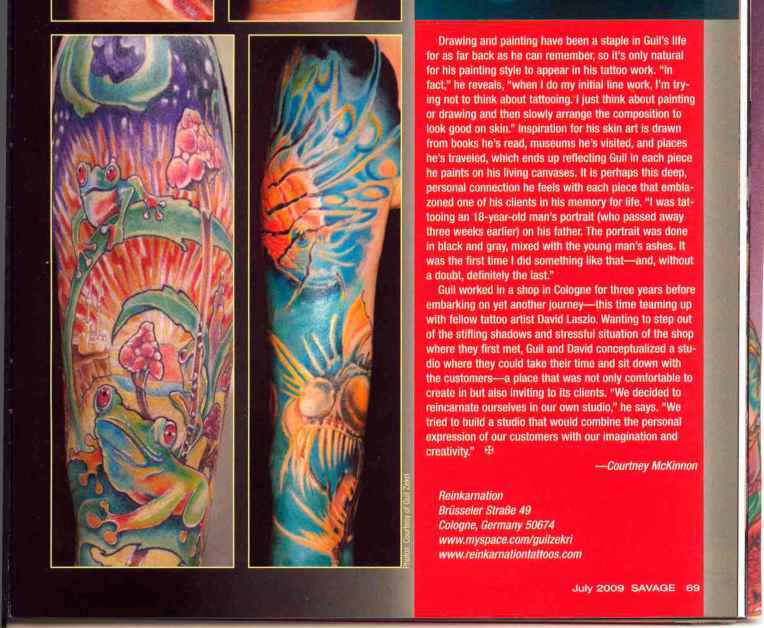 "I flew S J to San Francisco and Suzanne Shifflett tat-, W1 tooed my inner thigh, Rico from Daruma Goya § in Japan did both of my legs the next two days, and then Henry Goldfield tattooed the side of my knee. It was fun, but I won't be doing anything like that anytime soon." Once. ? Dave, a student and tattoo shop counter guy ' from New Orleans, received his first traditional Japanese tattoo a couple of years ago, he | decided to go for a traditional bodysuit. Trouble is, he also loves traditional American work, so that idea has been falling by the wayside. "I went through this phase of want-, ■ ing a bunch of tiny tattoos, so now I have an ; eagle and tall ship the size of a quarter and a one-feathered peacock." Dave Noellert at Uptown Tattoos in New Orleans, tattooed the Baku and Nue on his left [ ribs and thigh, the Kintaro on his back and the samurai on his right thigh. Ert at Uptown Tattoos did the Daruma behind his knee, the ||J escargot on his left foot and a few other small pieces. Rico and Shion from Daruma Goya in Iwate, Japan, are working on Dave's lower legs. Josiah at Big Kahuna Tattoo in Boca Raton, Florida, tattooed the skull and anchor ] on his right foot. And Danny Waller of Living ■] Art Tattoo in Gresham, Oregon, did the skull/ dagger/eagle behind his left knee. Even though Dave had a conservative upbringing, the boy knows how to have a good time. "When we were lining out my left ) ribs, I decided to get completely wasted on pills and Jameson. I completely blacked out and don't remember leaving the shop, but apparently I said, 'It was nice to meet you' as' I left. I got punched in the eye later that night ] at a bar—I probably deserved it." How to get heavy japanese tattoos?